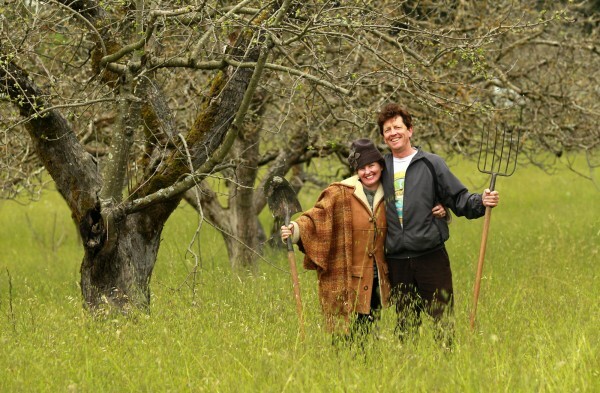 Paul and Kendra Kolling in a Sonoma County Orchard. Photo: John Burgess/Press Democrat. More and more quality growers across the nation are realizing that the fruit and vegetables they produce reflect not only careful nurturing and sustainable growing conditions--but also qualities inherent in the climate and soil where they are grown. Just like grapes, veggies and fruit also reflect terroir. For example, Sonoma County has long been famous for producing apples (grapes aren't alone in responding favorably to coastal fog and volcanic soils). Some apple varietals, such as the Gravenstein, are most successfully grown here. So if a company ships inexpensive, mass-produced apples from another state into Sonoma County, presses them, and slaps a label on the bottle that says "Made in Sonoma County," is that fair to someone who grows organic apples in a sustainable manner in Sonoma County? I don't think so, and I'm certainly not alone. More and more people are beginning to see the value in packagers meeting legally-mandated requirements when placing the growing area on, say, a bottle of apple juice. An example: if you want to put the words "Sonoma County" on a bottle of wine, 75% of the grapes in that wine must have been grown in Sonoma County. Doesn't that make sense for apples, too? Read my story, Nana Mae Organics: Grown and made in Sonoma County, to learn more. Sounds great. Yeah if that so then why not. That is a good country I think because most popular fruits came in there like apples and grapes as well.